IEEE 1149.1/1149.6 (JTAG) Verification IP provides an smart way to verify the IEEE 1149.1/1149.6 (JTAG) component of a SOC or a ASIC. The SmartDV's JTAG Verification IP works in a highly randomized manner to generate wide range of scenarios for effective verification of DUT. 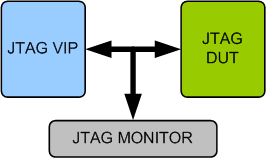 JTAG VIP includes an extensive test suite covering most of the possible scenarios and detection of protocol violation using a effective protocol-checker. Follows JTAG basic specification as defined in JTAG Specification 3. Supports Jtag protocol standard IEEE 1149.1 and IEEE 1149.6. Supports all the JTAG tap instructions. Supports Instruction register and Data register of size upto 64 bits. Proficiency to extend with user defined instructions and registers. Proficiency to extend with user defined functional coverage points. Supports callbacks for user to define custom instruction decoder. Supports callbacks for user to get callback on each state of TAP controller. Functional coverage for checking all possible stimulus checking. Faster testbench development and more complete verification of JTAG designs. SmartDV's IEEE 1149.1/1149.6 (JTAG) Verification env contains following. Complete regression suite containing all the IEEE 1149.1 (JTAG) testcases.